The 2nd Amendment has undergone intense judicial scrutiny since the Founding Fathers declared the “right to bear arms.’ Much of the legal impetus behind interpreting the 2nd Amendment is because the federal government has not established uniform statutes that apply to the “right to bear arms” for American citizens. Another constitutional amendment has allowed individual states to determine what the “right to bear arms” means. Because of the 10th Amendment, firearm laws differ among the 50 American states. State legislatures have passed the vast majority of firearm laws. Most firearm laws have created a much narrower definition of gun owner rights than what federal laws have mandated. Perhaps no other firearm statute varies more among the states than the legal interpretation of concealed carry. Some state have enacted less restrictive firearm laws than what exists at the federal level, while other states place more restrictions on gun owner rights. Moreover, the United States Supreme Court ruled in Printz v United States that local law enforcement agencies do not have the legal obligation to enforce federal gun laws. You have two methods for carrying firearms in the United States: open and concealed. Open carry generally means a firearm is visible to everyone, while concealed carry means a firearm is hidden from plain sight. Each of the 50 states has passed laws governing open and concealed carry rights. In theory, each state follows the broad legal intent of the 2nd Amendment to protect the “right to bear arms.” However, some states have implemented regulations that prohibit concealed carry firearms. Many of the restrictions concern the application process and three legal definitions for concealed carry. The three legal definitions states use for concealed carry include unrestricted, shall issue, and may issue. Unrestricted concealed carry laws allow gun owners to conceal carry, without having to apply for a permit. Shall issue requires gun owners to have a permit for the concealed carrying of a firearm. States that operate on may issue concealed carry statutes often require gun owners to demonstrate a legally justifiable reason for the concealed carrying of firearms. In general, southern states have passed less restrictive concealed carry laws than the statutes enacted by northern states. California, Massachusetts, and New York have passed the most restrictive concealed carry firearm laws. Alabama requires a concealed handgun permit to carry a concealed handgun with no firearm safety course required, the license is valid for five years. Open carry is allowed without a permit with a few restrictions such as the handgun must be secured in a holster. The concealed carry laws for Arkansas are somewhat confusing but as far as I can tell from my research Arkansas does not require firearm owners to apply for a permit to open or conceal carry firearms. The state has added a clause in a statute to permit gun owners to conceal carry when they are “on a journey,” which more than one court has declared to mean when a resident is traveling outside the county where he or she lives. Gun owners can store handguns inside a vehicle in plain sight or concealed in a glove compartment. “The Golden State” is not golden when it comes to gun laws. California has enacted a strict may issue concealed carry law that forbids gun owners from carrying concealed firearms of any kind without a permit. The state also places tough restrictions on open carry firearms, with residents in just a few counties allowed to open carry both handguns and long guns. Tough open and concealed carry laws are not surprising in a state that mandates gun owners to register firearms and undergo extensive background checks. Considered one of the more libertarian states, Colorado does not require a purchase permit or registration to own firearms, however, you’ll need a concealed carry permit to carry a concealed handgun. Gun owners do not need a permit to open carry, except in designated areas such as locations within Denver and surrounding suburbs. The state requires firearm owners to register handguns and long guns. As a shall issue state, Connecticut requires gun owners to obtain permits for the concealed and open carry of handguns. Several court decisions have upheld challenges to the shall issue designation. “The First State” has one of the most gun friendly laws of any state located along the eastern seaboard, however, you must have a valid state-issued permit to conceal carry a handgun. Delaware does not require permits for the open carry of firearms, although courts have ruled differently when it involves open carry inside a vehicle. You’ll need a state-issued permit for open or concealed of a handgun in Georgia. However, there is no required firearm safety course, and the permit valid for five years. “The Aloha State” officially operates as a may issue state, but the fact is Hawaii is more like a no issue state. Hawaii does not issue permits to conceal carry a handgun, even though residents of the island state can apply for a permit it will be denied, and gun owners need a permit just to buy any type of firearm. Open carry is also illegal in the state. Residents of Idaho do not need a permit to conceal carry handguns. However, non-residents must apply for a permit to conceal carry within certain cities. You are allowed to conceal carry a handgun in your vehicle, as well as open carry any type of firearm without needing a permit. Indiana does not require gun owners to carry a permit for long guns, such as the weapons used for hunting. You need a permit to open carry any type of firearm and gun owners may not open carry guns of any size inside a commercial vehicle. The restrictive open and conceal carry laws are recent additions to the Indiana legal code. “The Hawkeye State’ mandates every gun owner must apply for a permit to conceal carry handguns. However, you do not need a permit to carry long guns, even if you conceal carry a rifle or shotgun in the trunk of a vehicle. Iowa gun owners do not need a permit to open carry outside city limits. The permit is valid for 5-years. Residents of Kansas and out of state visitors do not need a permit to open or conceal carry any type of firearm. Kansas gun-friendly laws also apply to open and conceal carrying firearms inside vehicles. As of 2018, no proposed legislation is on the docket to change any facet of Kansas gun laws. “The Bluegrass State” requires gun owners to apply for concealed carry handgun permits. You can conceal carry any type of long gun in Kentucky. A few municipalities such as Louisville prohibit the concealed carrying of long guns inside of vehicles. The state does not require a permit to open carry firearms. Louisiana operates as a shall issue state, which means gun owners must have a permit to conceal carry handguns. In deference to hunters, the state does not require a conceal carry permit for rifles and shotguns. Local ordinances can regulate open carrying of firearms, but Louisiana law allows you to open carry without applying for a permit. If you want to live in a gun friendly state located in the northeast, Maine is the place to be. You do not need a permit to carry a concealed handgun if you’re 20+ years. You can also open carry in Maine, without needing a permit. Maryland is a shall issue state and you’ll need a valid state-issued permit to carry concealed. Open carry is also illegal without a permit. Massachusetts has one of the strictest collection of gun laws in the United States. You need a permit to conceal carry a handgun. The may issue state also requires a permit to open carry handguns and long guns, with the exception of using long guns for hunting purposes. Magazines cannot exceed 10 rounds for any type of firearm. To carry a concealed handgun in Michigan you’ll need a valid state-issued permit, however, open carry is allowed in the state with no permit required. To get a concealed handgun permit you’ll have to take a firearm safety course, and the license valid for up to five years. “The Gopher State” requires a state-issued permit for the concealed or open carry of handguns, however, open carry of rifles and shotguns in public prohibited. A valid state-issued permit is required to carry a concealed handgun in Mississippi, however, a permit is not required for open carry in the state. “The Show Me State” does not require a permit for concealed carry or open carry of handguns. As of 2018, Missouri legislators have at least one bill on the docket that places restrictions on vehicle concealed carrying of firearms. With mostly vast wilderness covering the state, Montana legislators have crafted gun laws to match the temperament of the free-spirited pioneers who live in “Big Sky Country.” There are no concealed carry restrictions for firearms, except the requirement to obtain a permit in some cities. You do not need a permit to open carry any type of firearm. Concealed carry is legal in the state with a valid permit, however, no permit is required for open carry. You’ll need a valid permit for concealed carry of a handgun, however, open carry is legal without a permit. Concealed and open carry of handguns requires a valid license or permit to possess a loaded firearm. The state rarely agrees to issue a concealed carry permit for ordinary citizens and a permit is required for both open and concealed carry. New Mexico gun owners require a permit to conceal carry handguns, but they are allowed to conceal carry long guns without any restrictions. The application process for a concealed carry handgun permit is considered one of the easiest to go through in the United States. Because of the ease of applying for a concealed carry handgun permit, many gun law experts refer to New Mexico as a limited unrestricted state. Open carry is allowed without a permit. You’ll need a valid permit to conceal carry a handgun in “The Empire State.” You cannot open carry a handgun in any circumstance, including when you hunt in season. Shall issue in North Carolina means gun owners must possess a valid permit to conceal carry handguns, however, open carry is allowed without a permit. On March 23, 2017, a bill permitting constitutional carry without a permit was signed by Governor Burgum. You can carry concealed if you’re a legal citizen of the state for at least one full year and you also must have on you a state-issued photo ID. You can also carry loaded firearms inside your legally owned motor vehicle without a permit. However, concealed carry at a school, church, sporting event or public building is not allowed. Open carry of a loaded handgun will still require a permit. With three major metro areas, “The Buckeye State” is surprisingly lenient when it comes to gun laws. Ohio requires a permit to conceal carry handguns, but hunters can mount long guns on truck racks. Open carry is legal without a permit. Before carrying a concealed handgun in Oklahoma you’ll need a valid permit, however, open carry is legal without a permit. Oregon has imported many of the same types of firearms restrictions found in California law. The state requires a permit to conceal carry a concealed handgun. However, “The Beaver State” does not restrict the right to open carry. You need a permit to conceal carry a concealed handgun in Pennsylvania. Gun owners are allowed to open carry, with the exceptions being within Philadelphia city limits. To carry a handgun concealed or open carry you’ll need a valid permit. South Carolina bucks the trend of southern states enacting gun friendly statutes. The state prohibits open carry and you need a state-issued permit to carry concealed. Handguns can be carried inside an automobile but must in a closed glove compartment, closed console, closed trunk, or in a closed container secured by an integral fastener. You can open carry in South Dakota. If you open carry inside a vehicle, the firearm must be clearly visible. Courts have rules “clearly visible” means the entire firearm must be out in the open in plain sight. You cannot conceal carry inside a vehicle and you need a permit to conceal carry a handgun in South Dakota. 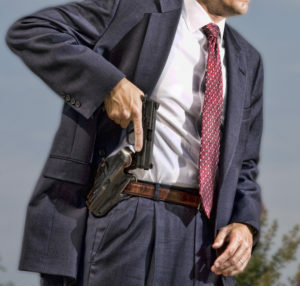 “The Volunteer State” requires a permit to conceal carry handguns or open carry handguns on your person outside your or inside your vehicle, but the state does not restrict the carrying of firearms inside your automobile as long as the firearm is not on your person (as in a holster on your hip). Any long gun that an owner open carries outside a vehicle must be unloaded at all times. Tennessee mandates gun owners apply for permits to conceal or open carry handguns outside an automobile. See my more detailed article on TN concealed carry here. The state requires a permit to conceal carry a handgun, but not for conceal carrying a long gun. You can open carry any kind of firearm, if you have a concealed-handgun license, as state law includes language that prevents municipalities from passing more restrictive gun laws than the gun laws enacted by the state legislature. You need a permit to conceal carry a handgun, however, you do not need a permit to conceal carry a handgun inside of a car. You’ll need a permit to open carry handguns if they are loaded, however, you do not need a permit to open carry an unloaded handgun. You can open carry any type of firearm in a vehicle, as long as it isn’t loaded. Vermont leans libertarian, which makes the state’s gun laws more lenient than the gun laws on the books in many other states. The state has never required permits of any kind for gun ownership and gun owners can open and conceal carry a handgun or longgun, including inside a vehicle, with the exception of commercial vehicles. The only restriction imposed by Virginia gun laws concerns concealed handguns. Gun owners must apply for permits to conceal carry on their person and inside of vehicles. You can conceal carry a long gun without a permit, as well as open carry any type of firearm in Virginia. Open carry inside of a car means placing a firearm in plain sight. State law in Washington defines shall issue as requiring gun owners to apply for permits to conceal carry handguns. Gun owners do not need a permit to conceal carry long guns. The state mandates the registration of handguns, as well as background checks conducted by licensed dealers. After passing a background check and registering a firearm, you can open carry in Washington. You need a permit to open carry a loaded firearm inside a vehicle. Long guns must be unloaded at all times inside of cars. Like Vermont, West Virginia is a gun friendly state. As of June 5, anyone over age 21 who can legally possess a firearm will be allowed to carry it concealed on their person without having to obtain a permit and open carry is also allowed. Wisconsin requires gun owners to obtain a permit for the concealed carry of handguns. You do not need a permit to conceal carry a long gun. You do not need a permit to open carry. Wisconsin recently eliminated the requirement of obtaining a permit for open carry, except for the open carrying of handguns inside of vehicles. Residents of Wyoming do not need a permit to open or conceal carry any type of firearm. Legislators typically write state gun laws to give hunters and ranchers flexibility in the transport of firearms. Non- residents of Wyoming are required to obtain a permit to conceal carry firearms. The state imposes no restrictions on firearms stored in vehicles.